Love playing table tennis? You can play it anywhere be it dinner table, kitchen table or on outdoor picnic table with Sportcraft Anywhere Table Tennis Set. 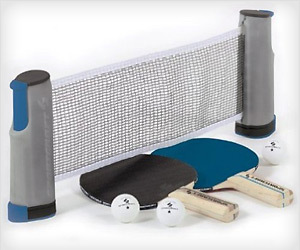 It has expandable and retractable table tennis net with adjustable posts that can be attached to any table up to 75 inches wide and 1.75 inches thick.